We can help groups and communities create opportunities for bicycling. Let’s get the conversation rolling! We offer in-classroom bike education and on-street small group riding programs for adults. Each program is different depending on what you want to learn. Bike Sharing 101 presentations are free and our on-street/on-bike How We Roll program (Program Fees $) are the two options of courses. 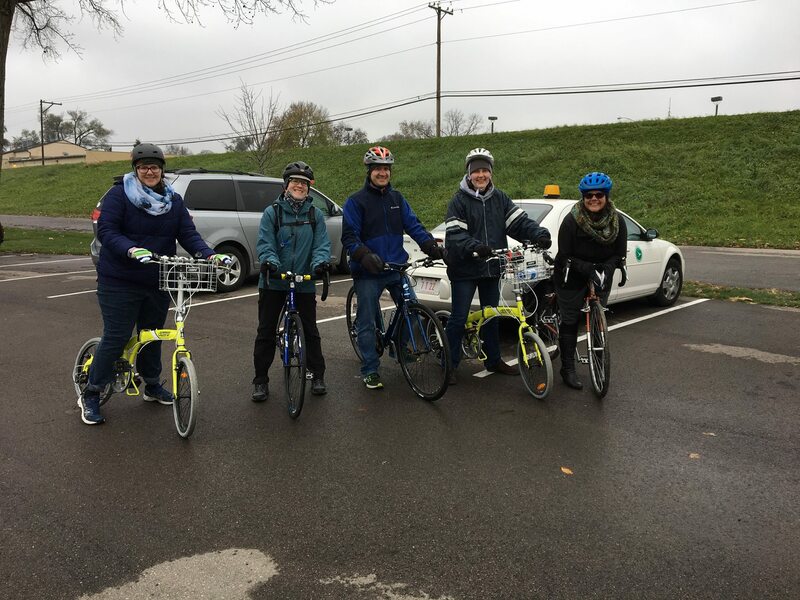 Our How We Roll group rides offer an on-road experiential learning opportunity in which participants learn bicycle law and practice positioning themselves on the road for maximum visibility and predictability. This award-winning program featured in the League of American Bicyclists’ Bicycle Friendly America Guide 2012, highlighting the work of Yay Bikes! who created the curriculum and trained Bike Miami Valley staff to implement the program in the greater Dayton region. *A $50 deposit fee is required for the instructor’s time and planning, this is non-refundable if your party cancels. How We Roll is innovative cycling education that forsakes the classroom for a fun, informative, on-bike experience. This unique cyclist education program is designed to teach people how to ride bicycles confidently in traffic, foster a positive bike culture, and reduce the incidence of bike/car crashes. A safety curriculum is the backbone of the ride experience. Instructors describe and teach participants how to be visible and predictable and follow traffic law. Miami Valley Cycling Summit: The 2019 Cycling Summit will be held in Miamisburg on May 10, 2019. The Miami Valley Cycling Summit is an event aimed at reaching cycling advocates, policymakers, and the local business community and conveying to them the importance of a vibrant cycling community that can drive economic improvements. Waggle: Bike Miami Valley is working with UpDayton on continuing the “Waggle” project. UPDATE: New Waggle signs are being printed to replace the weathered signs originally put up in 2012. Thanks to the Downtown Dayton Partnership and committed volunteers of UpDayton and Bike Miami Valley, this grassroots effort was embraced and will continue. The Waggle project aims to highlight an existing network of safe, convenient, connected, on-street bike routes for use by bicyclists of all skill levels. These routes will connect residents in the Dayton, Ohio region to points of interest within the urban core and beyond, with the intention to promote cycling awareness and advocacy.We will give you updates as the project progresses.